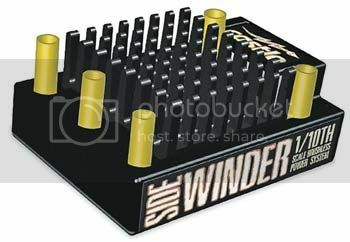 Recently purchase that new Super Clodbuster you've always wanted? Or maybe you've found one from your childhood and want to resurrect it. We've written a step-by-step process highlighting the main components of the Clodbuster. We'll concentrate both on keeping your Clodbuster mostly stock, as well as outlining areas to improve on when building a retro-style truck. Whether you have a box-stock Clod you want to slightly modify, or a truck you want to build for retro-class competition, this guideline will be a great resource tool! The most important parts to building your truck! 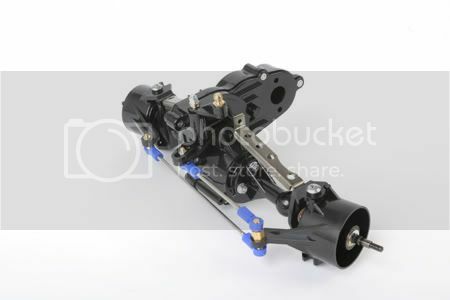 Whether you choose to purchase a brand new Tamiya axle set (http://www.crawfordperformanceengineering.com/product_info.php?products_id=465) or supply your own, the axles are what makes your truck tick! Clodbuster axles are designed to have the motor installed directly to them, so you will need one motor per axle to complete your truck. One of the most effective upgrades when building your axles is to purchase a set of bearings. 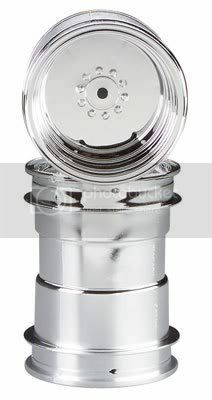 A complete set of bearings will have 24 bearings included (http://www.crawfordperformanceengineering.com/product_info.php?products_id=473). The stock plastic Clodbuster tub chassis gives your truck that old-school, full-frame, appearance found on full size monsters from the 80s. There are a couple weak points when using this chassis that should be addressed however: 1. The area where the plastic suspension arms connect to the center of the chassis is prone to breaking. 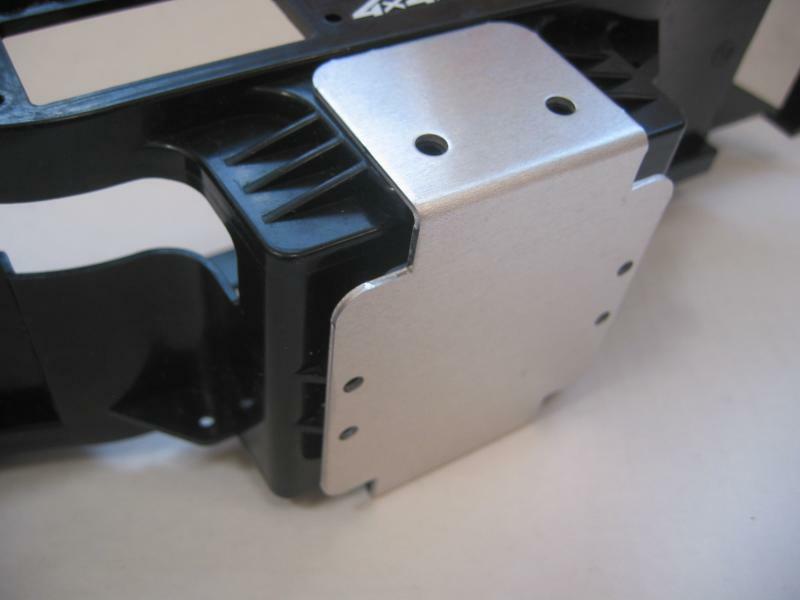 We've addressed this area by introducing our aluminum center chassis brace, pictured below (http://crawfordperformanceengineering.com/product_info.php?cPath=5_115&products_id=703). 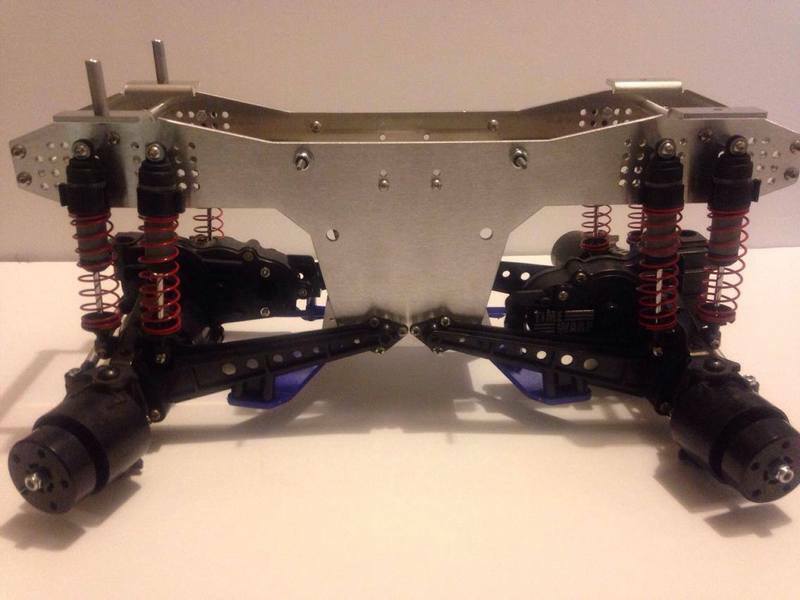 This slips over the stock chassis and provides reinforcement where the suspension arms connect. 2. 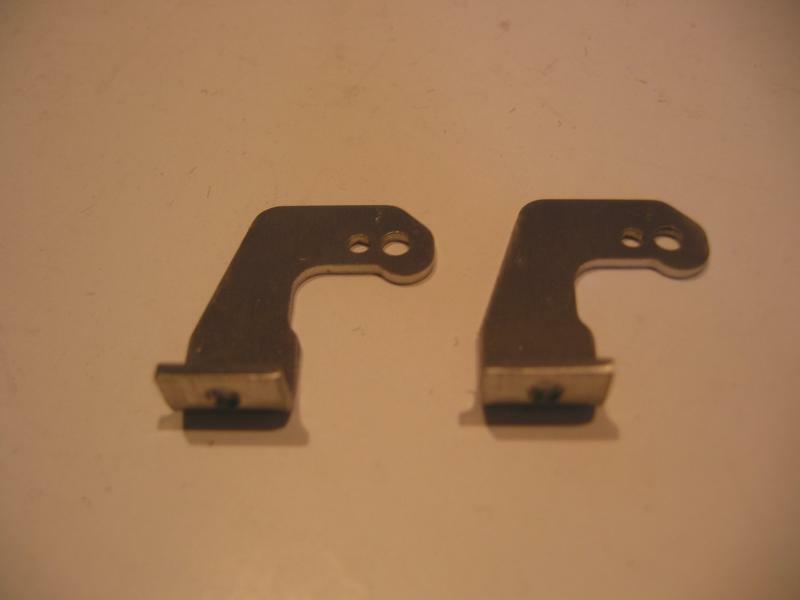 The plastic anti-rotation brackets (stock P/N B11) included with the stock kit break constantly as they are under stress as the suspension cycles. We've addressed this breakage by designing stainless steel versions (http://crawfordperformanceengineering.com/product_info.php?cPath=5_115&products_id=597) that directly replace the stock parts. If you're looking for an upgraded chassis that still allows for the use of the stock body and suspension, we've designed our Timewarp chassis just for you! (http://crawfordperformanceengineering.com/product_info.php?cPath=1_23_150&products_id=923) This aluminum chassis eliminates all of the weak points from the stock chassis, while giving you multiple options for mounting your shocks and adjusting your wheelbase. The stock Clodbuster comes with eight friction style shocks. These leave a lot to be desired as far as performance. 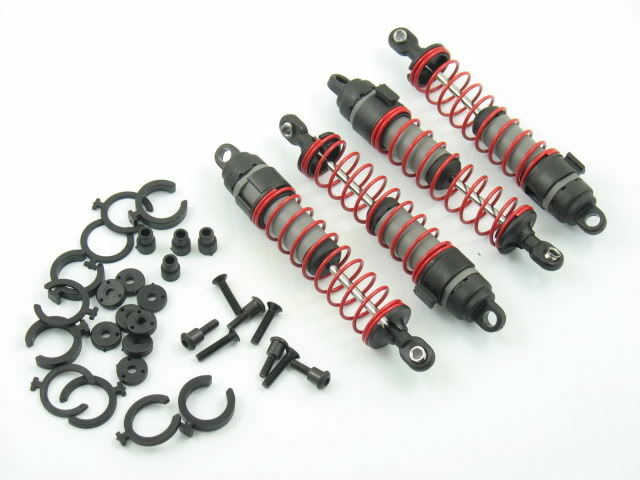 Oil-filled shocks are a huge performance improvement and the numerous shock oil and spring combinations allow you to tune your truck to suit your driving style. 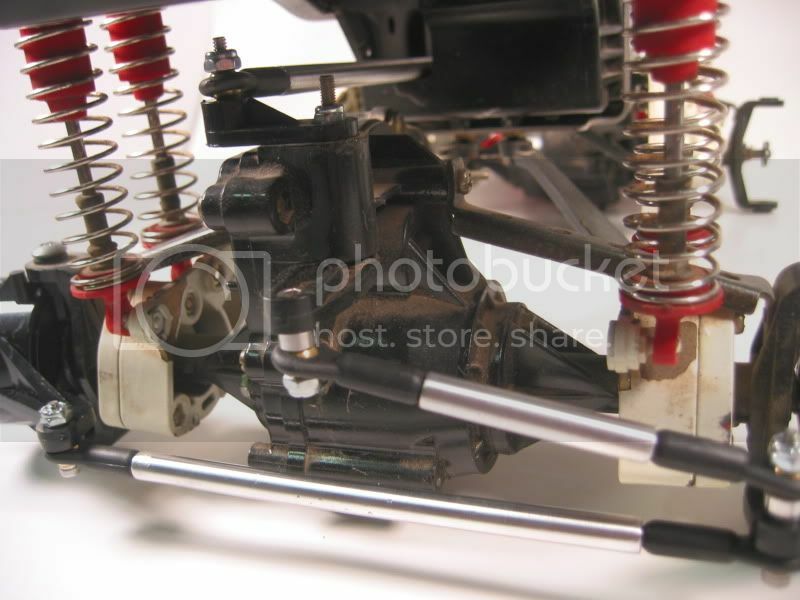 You really only need a total of 4 shocks to work with the stock chassis, but using the fulll 8 just looks cool! We've had good results using the inexpensive Traxxas Maxx shocks (http://www.crawfordperformanceengineering.com/product_info.php?cPath=10&products_id=601). If your stock Clodbuster already has a set of wheels, there's no problem using those. The Clodbuster axle uses a 12mm hex that inserts into the back of a pin-style drive hub. It's this hub that aligns with the back of the Clodbuster wheel to transfer power from the axle to the wheels. There are a few wheel options available (http://www.crawfordperformanceengineering.com/index.php?cPath=7_91). If your wheels are old/damaged, or if you need wheels, the stock chrome Tamiya plastic wheels are a great looking and lightweight option. For the ultimate in scale realism, beadlock wheels replicate the look of the full-size monsters! There are also a few wheel options available (http://www.crawfordperformanceengineering.com/index.php?cPath=7_91). JConcept Tribute wheels (pictured below) eliminate the need for the adapters above, and come with different offset hubs depending on the width you want your truck. For the ultimate in scale realism, planetary hubs and beadlock rings are also available that replicate the look of the full-size monsters! Again, the stock tires included with the Clodbuster will work fine. You can also upgrade your truck with a number of different tire options (http://crawfordperformanceengineering.com/index.php?cPath=7_32_139). For retro racing racing, the JConcepts Firestorm (pictured below) provides great traction. 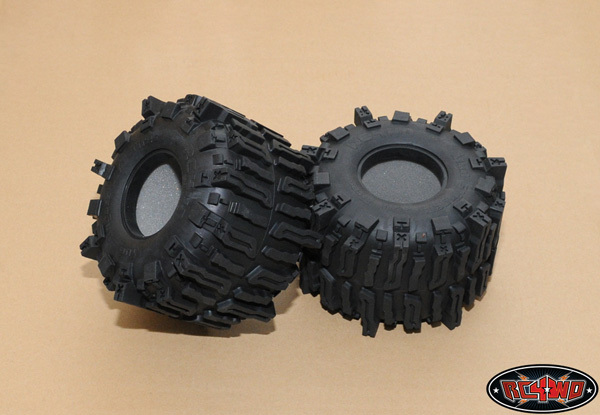 If you want to bash outdoors on hard dirt/gravel, the Imex Puller or RC4WD Rumble tires are great choices. For deep grass or muddy conditions, we recommend using the RC4WD B&H or Mudslinger (pictured below) tires. Note: If you're looking to build a retro-class truck, there are typically some limitations regarding tires. 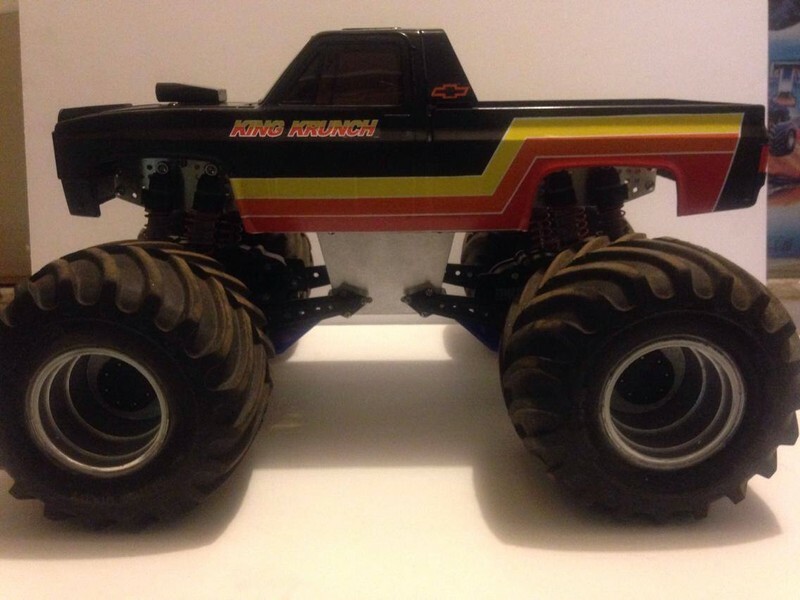 Stock Clodbuster/Bullhead, Kyosho USA-1, Imex Dually (#8660), RC4WD B&H, and JConcepts Firestorms/Golden Year are all accepted tires for most clubs. Now that you have a rolling chassis completed, it's time to personalize your truck! Almost any lexan body designed for the T/E Maxx or Savage will work on your Clodbuster in addition to the stock ABS hard body. You have the option to either paint the body to your liking or to use decal kits designed to replicate the full size monsters seen performing today (http://www.crawfordperformanceengineering.com/index.php?cPath=4)! If you decide to paint your lexan body, be sure to follow the manufacturer's painting instructions and to use a paint that is designed specifically for lexan/polycarbonate bodies. Not doing so may lead to paint flaking off the body and runing a perfectly good paintjob. - Aftermarket closed/sealed-endbell brushed motors are becoming harder to find, but often allow for an inexpensive way to improve the performance of your truck. Since the Clodbuster uses two gearcases, with the rear gearcase reversed, you need to ensure you either purchase motors with zero timing or purchase a motor set that includes a reverse rotation motor. This reverse rotation motor will be installed on the rear gearcase. For a zero timed motor, simply reversing the positive and negative motor leads will reverse the direction the motor spins. For a faster backyard bashing Clod without moving to brushless motors, we recommend using motors in the 15T to 17T range. http://crawfordperformanceengineering.com/product_info.php?cPath=11_19&products_id=1019. The lower the number of motor turns, the faster your truck will be. 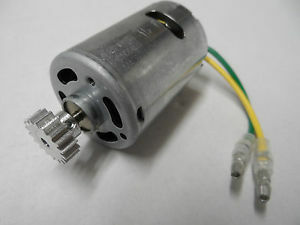 The motors will also require more maintenance as the higher current draw wears brushes faster. A higher turn motor will be slower but will have more torque for climbing/crawling. The Clodbuster axle uses a 32P gear system, and we recommend the use of an aftermarket 13T steel pinion gear (http://www.crawfordperformanceengineering.com/product_info.php?cPath=11_19&products_id=61). Note: If you plan on running a retro Clod in competition, you will need to typically use a closed/sealed endbell motor that 27T or higher. You should always check the rules package for your specific club as motor rules will vary! The original stock Clodbuster kits were issued with a mechanical speed controller. 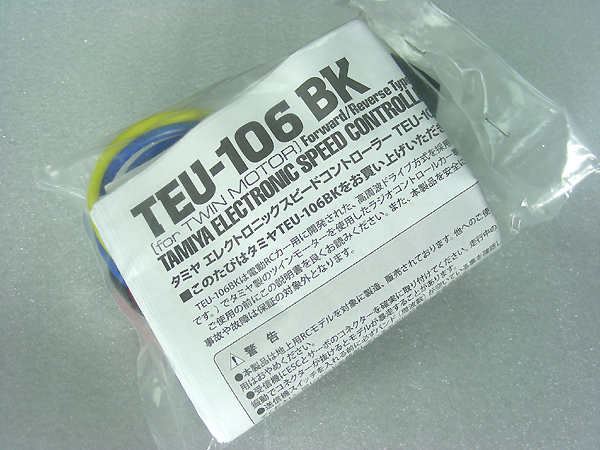 The latest models have been upgraded by Tamiya to include a TEU-106BK (http://crawfordperformanceengineering.com/product_info.php?cPath=11_18&products_id=917) electronic speed controller (ESC). An ESC provides a huge leap forward in both performance as well as the ability to control the speed and smoothness of your truck's power. Upgrading to an ESC is one of the best changes one can make to a stock Clodbsuter! 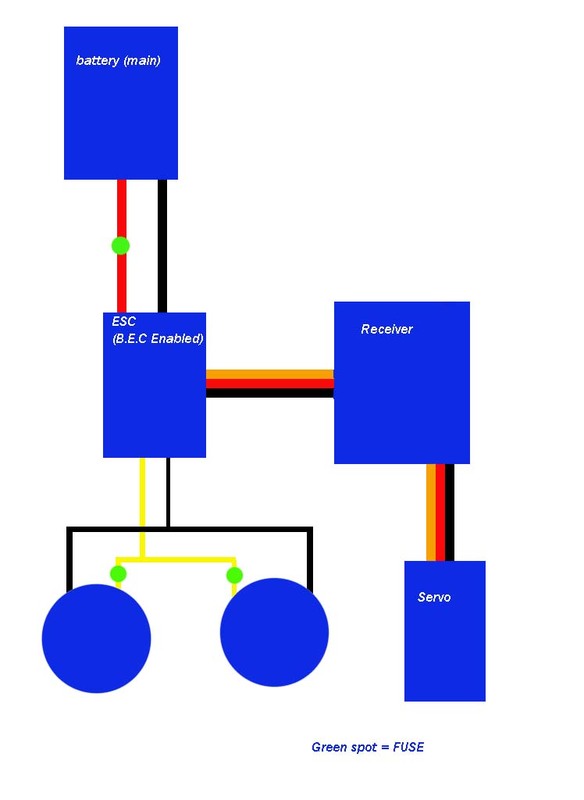 - When using brushed motors, you can use a single ESC to control both motors. The Traxxas EVX2 or Castle Creations Sidewinder (http://www.crawfordperformanceengineering.com/product_info.php?cPath=11_18&products_id=556) are also both good ESC options. For optimal performance, ensure that both motors are wired in parallel (diagram below). Typically, motor 1 is the rear motor, with wires running from the rear motor to the front motor (motor 2). Note: When running dual motors in parallel on a single ESC, you need to realize that the number of turns each motor has is essentially cut in half. For example, when running two 20T motors wired in parallel, the current seen by the ESC is equal to running a single 10T motor. Keep this in mind if the ESC you're using has a motor turn limit. The stock TEU-106BK speed control is only rated to run up to two 27T motors. Note: If you want to run lower turn (ie. 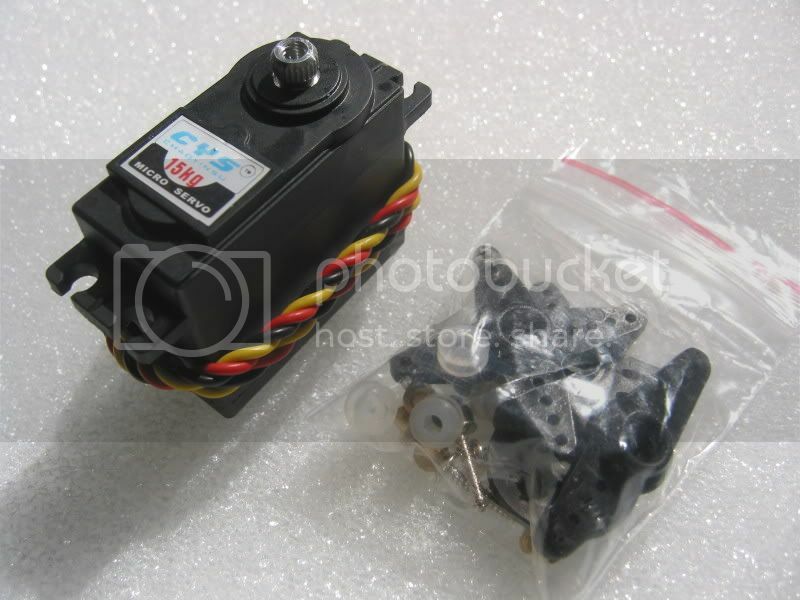 faster) motors, you'll also need to look at upgrading to one of the aftermarket ESC's described above. If you're building a retro truck, or if you're looking for better steering in general, we've designed our vertical servo mount (http://crawfordperformanceengineering.com/product_info.php?products_id=460) that relocates the servo from the chassis to be directly on the axle. This layout gives you MUCH improved steering control. Note that if you want front and rear steering, you'll need 2 of these mounts along with a 2nd steering servo. We're almost all the way to a running truck now! Since we need a way to power and steer our truck, lets take a quick look at requirements for the servo and batteries needed for your truck. Servo: Due to the size and weight of your Clodbuster, we recommend use of a hi-torque, metal gear servo (http://www.crawfordperformanceengineering.com/product_info.php?cPath=11_18&products_id=2) Typically, a servo rated at 150 in-oz or higher will work well with your Clodbuster. In racing applications, servos with faster response or transit times can make or break your race! Battery: There are two main types of batteries, NimH and LiPo. NimH batteries have been around for years, and are typically what most people have readily available from older R/C vehicles they've used. 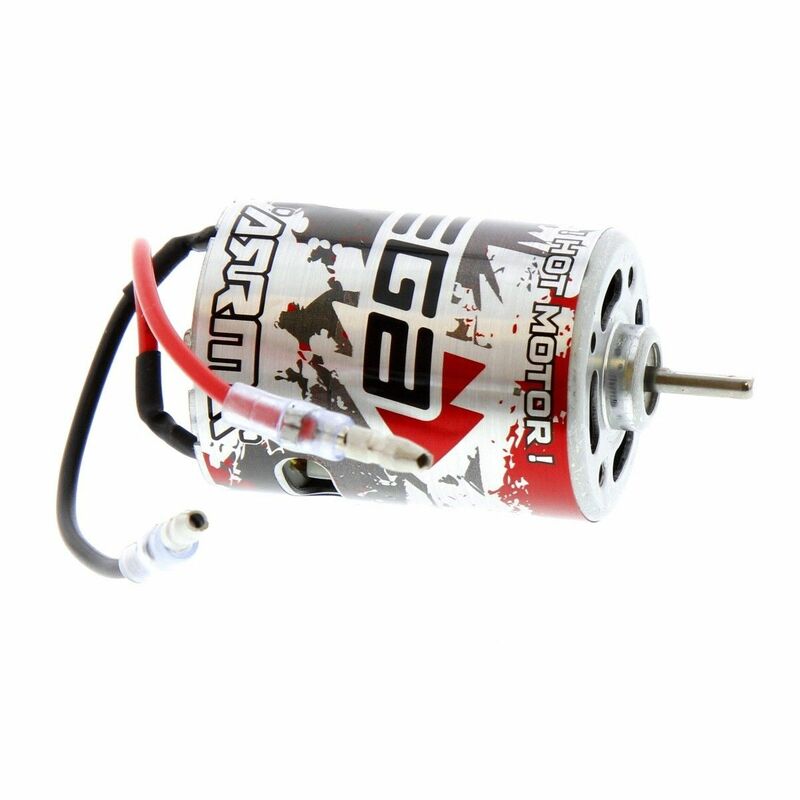 This style of battery has been surpassed in performance by the LiPo battery however. 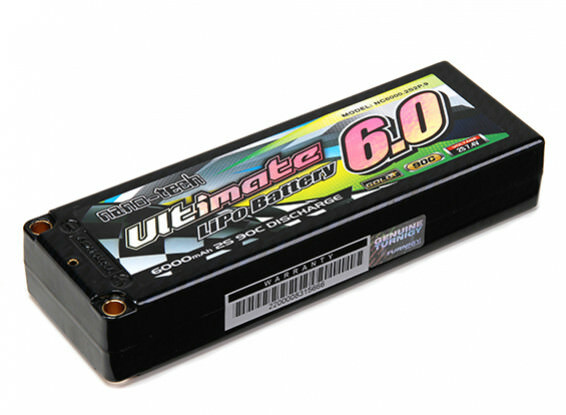 LiPo batteries both outperform and are lighter weight than their NimH counterparts. Specifically for the Clodbuster and its dual motor design, we recommend using a single 2S (7.4v) LiPo battery with a 50C+ discharge and a 5000+ mah rating. http://crawfordperformanceengineering.com/product_info.php?cPath=11_18&products_id=1092 The discharge rating is how much current the battery is able to draw, while the mah rating describes how long the battery will last on a charge. In either case, a higher number equals more power and/or a longer run time. Dual batteries can also be used, but will add weight to your truck. Note: We always recommend using a hard-shell or hard case LiPo in your off-road vehicle. Failure to do so may lead to battery damage and possible loss of your vehicle (and its surroundings) due to a battery fire! The radio (or transmitter) is your only control over your Clodbuster. Radio functions vary greatly depending on their cost and number of channels, but all radios will control the steering and throttle for your vehicle. We highly recommend the use of a newer style radio featuring a 2.4ghz frequency (http://www.crawfordperformanceengineering.com/product_info.php?cPath=11_18&products_id=279) as these are much less prone to interference compared to the older AM style radios. For a stock Clodbuster, a 2 channel radio will work fine for your truck. Down the road, you may choose to install and operate your Cloldbuster with independent rear steering. In many cases, a radio having a 3rd channel will allow for control of the rear steering. Some radios are designed and pre-programmed with different rear-steering functions, while others allow you to control the rear steering completely independent from the front wheels. 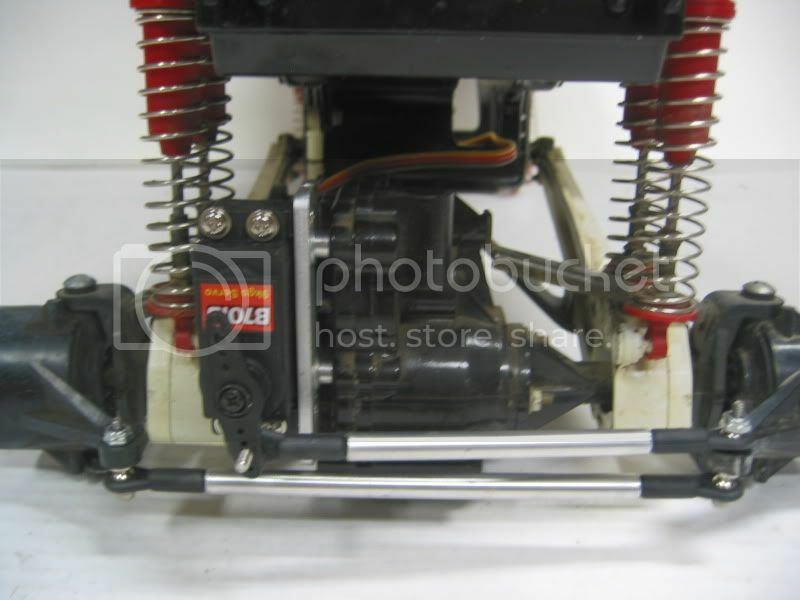 One our race Clodbusters, we do not use rear steering in order to maximize stability at high speeds. Hopefully this guideline has been a helpful resource for you in determining the path you want to take with your Clodbuster! If you have any questions regarding your specific build, feel free to contact us using the "contact us" form on the website or directly via phone during the office hours listed. Thanks! This product was added to our catalog on 01/17/2018.